That wall isn’t there just to keep me in, but to keep you out. —Tyrone W., former prisoner and participant in the Inside Out Prison Exchange. The United States incarcerates more of its own citizens than any other country in the world, and we are the only Western democracy to retain the death penalty. 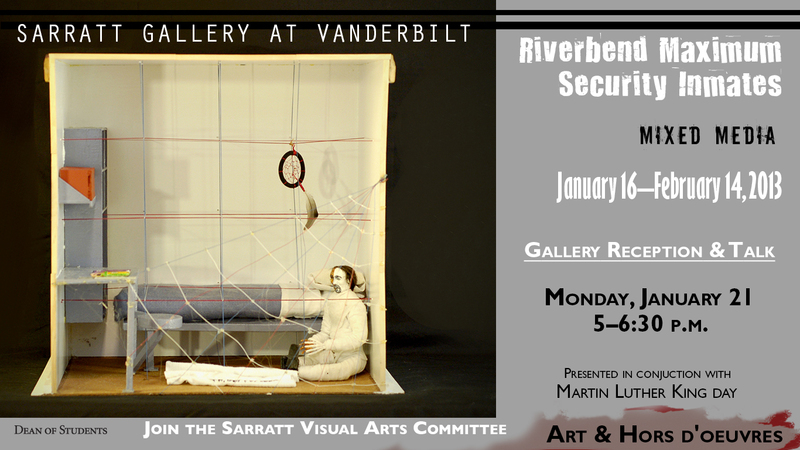 As part of A Year of Rethinking Prisons, Sarratt Gallery presents artwork created by prisoners on death row at Riverbend Maximum Security Institution in Nashville, Tennessee. The art seeks to convey the prison environment and to explore possibilities for living, thinking, working, and creating while on death row. This show grows out of a weekly philosophy discussion group facilitated by Dr. Lisa Guenther of the Vanderbilt Philosophy Department, in which prisoners and volunteers meet to discuss work by Plato, Martin Luther King, Michelle Alexander, and others. We call ourselves REACH Coalition. This art exhibition is the result of our collective effort to expand the discussion beyond the prison walls and beyond the language of philosophy. Reception following to 6:30 p.m.
Monday, January 21, 7 p.m. in Langford Auditorium, Vanderbilt University. Funded in part by a Creative Campus Innovation Grant Program from The Curb Center for Art, Enterprise and Public Policy. Abu Ali, Akil J, Devin B, Dennis S, Derrick Q, Donald M, Gary C, Harold N, Henry H, Kennath H, Richard O, and Ron C.
Poems, essays and stories by Derrick Q, Q and Abd-Al-Rafi, Donald M, Gary C, Harold N, and Kennath H are also available here. To contact the artists, please send an email to reachcoalition.tn@gmail.com.